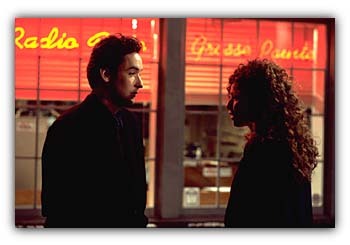 Grosse Pointe Blank tells the story of a hit man, Martin Q. Blank (played by John Cusack). By profession, he's a cold-blooded killer, but he doesn't think his job says anything about who he really is. However, he's struggling with an empty feeling that leads him into counseling sessions with a psychiatrist, Dr. Oatman (played by Alan Arkin). Once Dr. Oatman finds out Martin is a hired killer, he doesn't want him in his office. When Martin asks whether he should go to his ten-year high school reunion, Dr. Oatman fires back, "Go back to your high school reunion: just try not to kill anybody while you're there." John Cusack in Grosse Pointe Blank. This is the setup for a whimsical, optimistic comedy that is the equivalent of a super-light soufflé. 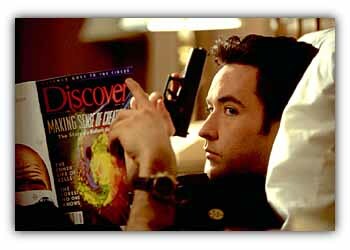 Don't look for anything substantial in Grosse Pointe Blank. Served up by the same producing team (Susan Arnold and Donna Roth) responsible for Benny and Joon, Grosse Pointe Blank suggests that a hit man can be just like anyone else. The guy might be a hired assassin, but he's really no different than the guy behind the counter at QuickiMart. Hmm . . . well, if you can buy that notion, you might enjoy this movie. But if that sounds like a specious premise, you might have a tough time swallowing this yarn. Pulp Fiction also gave us a hit man as a likable central character, but Vincent Vega (John Travolta) was balanced by Jules (Samuel L. Jackson), who gave his victims fire-and-brimstone lectures before pulling the trigger. Grosse Pointe Blank only gives us the innocent, baby-faced visage of John Cusack. And Cusack is in way over his head. With Vincent Vega in Pulp Fiction, we got a charming character, but he also was a bit slow (e.g. he had been to Paris but now he only talks about their hamburgers). Cusack is also a charmer, but there's no down side to his character. He's a good guy who just happens to kill people as his vocation. That means his character has no depth, no past. The filmmakers act as if they actually believe, like Martin Q. Blank, that his vocation says nothing about his character. Yeah, it makes him suffer a spiritual crisis. But he's still essentially a good guy. Hmm . . . Without a "Jules" to play against, Cusack drifts in a void. 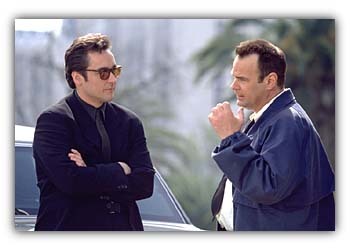 Dan Aykroyd plays a competing hit man, but once again, we get a character with little bite. Aykroyd, likewise, is simply a man at his job. If the filmmakers had actually paid attention to the movie they were creating, they might have seen the folly in the movie's central conceit and created a movie that shows Martin just how wrong he is. But instead, the filmmakers let him drift through the movie. This is essentially a movie about a guy (who just happens to be a killer) who suffers an identity crisis. His being a hit man is just part of the movies' essentially lightweight, wacky premise (the kind of premise you might expect in a TV situation comedy). Director George Armitage previously gave us the underrated Miami Blues with Alec Baldwin, a tense and unsettlingly movie that wasn't afraid to give us a lead character with a few not-so-likable quirks; however, in Grosse Pointe Blank Armitage gets a screenplay that pulls all the punches. He's also saddled with John Cusack. While Cusack was excellent in The Grifters, playing a likable con man (what other kind of con man is there? ), in Grosse Pointe Blank he's woefully inadequate. His face doesn't convey his past or his vocation--which it should in spite of Martin's insistence that no relationship exists. That's what the movie ultimately argues--that a connection indeed exists--and thus the emptiness that Martin is experiencing. But instead of going for irony, the filmmakers go for whimsy instead. They give us Minnie Driver playing cute in every scene (and that's cute in the very worst sense of the word). As Martin's ex-girlfriend, Driver flounces through the movie, attempting to charm us with her whimsical (everything is whimsical in this movie) nature. We're supposed to find it charming that her bedroom is exactly as it was when she last saw Martin, ten years ago. But instead it's pathetic. I have a theory that the words "wackiness ensues" are the unwritten words in almost every TV Guide sitcom plot synopsis. For example, Frasier: "Frasier runs for president of his condo association"--wackiness ensues. Or Friends: "Rachel arranges a date for Chandler with her boss"--wackiness ensues. The same sort of approach also applies to Grosse Pointe Blank: a hired killer goes to his ten-year high school reunion--(you guessed it) wackiness ensues. I can't help but feel that somewhere buried under the movie's ultra-lightweight exterior lurks a good movie--but this ain't it. By adopting an approach akin to TV sitcoms, the filmmakers rob the material of its weight.